Bettine and Arpi are people and animal lovers. Together with their team they provide unique horseback riding holidays in Romania. Bettine was a lawyer for 25 years and trained young lawyers and judges. Arpi studied medicine for several years, before becoming a sculptor and bronze caster. 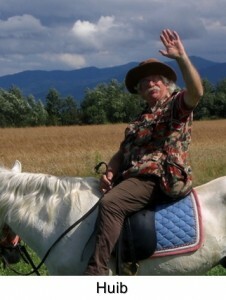 Arpi takes care of the horses and is your trail guide. His broad knowledge and ability to improvise come in handy during outward bound horseback adventures. He is familiar with all basic medical techniques for both people and animals, so a vet is rarely needed and first aid for people is always at hand. Bettine organizes everything around the farmhouse and is more importantly the chef. She started cooking at the age of six, not even being able to reach the stove without some elevation. Now she has developed into a real chef and prepares mouth watering dishes even in the field on a campfire. Both have a good sense of humour and love culinary pleasures. They have a relaxed view on life and enjoy lively conversation and witty banter. They will make you feel at home.